Curated by Carly: Personalized From Me To You Giveaway! I can't believe how cold it's gotten in the past couple days. It's getting close to single digits here in Chicago and I'm having to find ways to "preppify" my winter wardrobe on my commute to work. 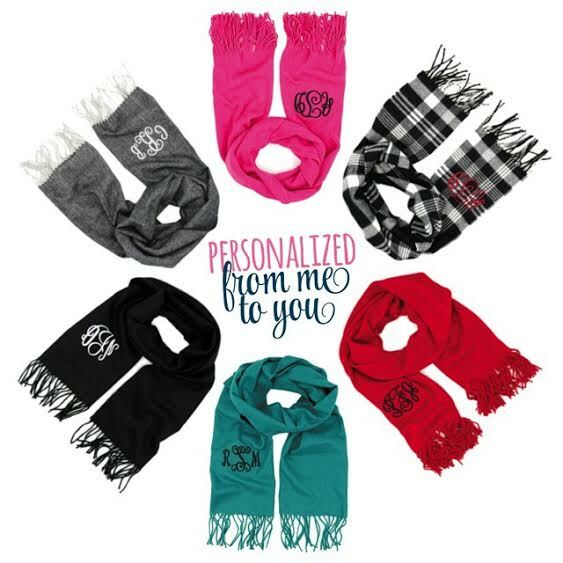 These Personalized From Me To You monogrammed scarves has been my go-to for the past couple days and I want to share it's warmth with you by giving one away! The team at Personalized From Me To You was kind enough to send me my own monogrammed scarf and I couldn't have been more happy with what they sent me. It was a tough decision, but I choose their Gray & Black Herringbone scarf with a white monogram. This scarf is perfect for the cold Chicago days we've been having and it mingles so well with my favorite jackets and other cold-weather accessories. Below is a sample of how I've been styling my Personalized From Me To You monogrammed scarf over the past couple days! Like what you see? Get this look here! One lucky winner will win a Personalized From Me To You scarf of their choosing with their favorite thread color and monogram. How do you win? As always, enter through the Rafflecopter widget below before 11:59pm CST on Saturday, November 22! The winner will be announced the following day on Twitter. Of course the scarf but I have a pair of hand knit mittens that are so warm too. I've wanted a monogrammed scarf for forever! I love the gray one. I've been wanted a monogramed scarf for so long! I bought a black jacket this year so It wouldn't clash with anything I would wear - unlike last year when I had an olive green jacket! It was cute, but limiting! I love my barbour but it was barely warm enough in the cold today! I think good gloves are key. Fitted leather gloves look so much more sophisticated than neon fleece ski mitts and (usually) offer plenty of warmth. I don't own anything monogrammed and as a fellow Rho Mu Chi Omega, you're probably thinking "really Ashley...come on." The only way I could keep warm this winter is with a monogrammed scarf. And my north face. Obviously. I don't own anything monogrammed. And as a fellow Rho Mu Chi Omega, you're probably thinking "really Ashley..come on". The only way I can keep warm this winter is with a monogrammed scarf. And my north face. Obviously. I need this scarf in every color! Love love love!! Love scarves and boots. And I'm obsessed with monograms lately! Lots of PFMtY items on my Christmas list this year (to give and recieve :) ) Love their stuff! !